Cancer season is finally upon us! 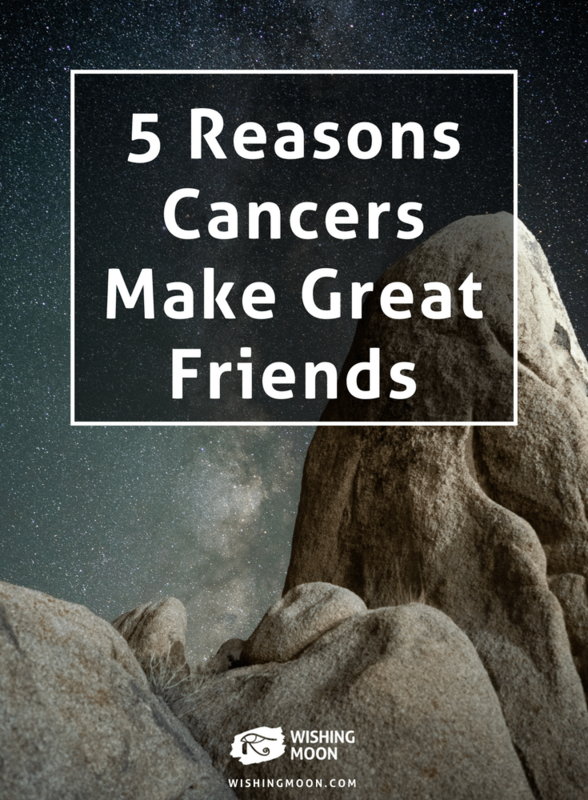 To celebrate the month ahead, let’s take a look at just a handful of reasons Cancers make great friends. Whether you’ve had a fight with your partner or you’re having problems at work, your Cancer friend won’t hesitate to lend you a shoulder to cry on. Your typical Cancer is a great listener, trustworthy secret-keeper and excellent advice giver. Cancers are passionate, caring and driven by a desire to make the world a better place. They aren’t content sitting at the sidelines and letting other people do the hard work. They’re fearless activists and have an impressive ability to inspire others to follow in their footsteps. If you want to spend your life in stitches, befriend a Cancer. Their smile is contagious, their laugh infectious and their sense of humour is second-to-none. The best part? Their jokes bring out the best in you. All it takes is an afternoon together and you won’t be able to stop cracking jokes left, right and centre as soon as you return home. 4. They make good choices – and this is likely to rub off on you! The average Cancer is hardworking, conscientious and wise. They tend to make good choices and if you spend enough time together, this sensible attitude is likely to rub off on you. Don’t get us wrong, Cancers certainly have a rebellious and spontaneous streak, but generally, they refuse to let sudden impulses send them down the wrong path in life. One thing’s for sure, if you’re ever feeling bored or restless, you can always count on a Cancer to lighten the mood, keep you entertained and get the party started. Since Cancers are sensible souls, they aren’t afraid to say ‘no’ to things that seem like a really bad idea. But you can always rely on them to provide an even better alternative.